Nestled in one of the nicest building built in 1900, The Saint-Paul combines tradition and design. It is not an overstatement to say that the Saint-Paul looks stylish. 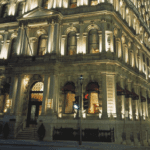 The magnificent stone facade of this last century building states that your stay at the Saint-Paul will be luxurious and elegant. Once you’ve crossed the entrance doors, you’ll be walking in a contemporary and design, borderline minimalist, environment which is a nice contrast from the classical facade. The lobby is impressive with an alabaster fireplace that warms up the cold atmosphere of this establishment. The 120 rooms and suites are on par, and the stone bathrooms won’t leave you cold. It’s hard to find anything bad to say about the hotel as a CD player, high-speed wifi, a minibar, a coffee maker, and bathrobes are available for your enjoyment. You’ll also be able to enjoy the nice restaurant ‘Le Hambar’ which opened in 2012 and is famous for its delicatessen platter. Let’s not forget the conference rooms, the business center and the gym, open 24/7. 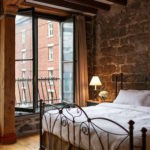 Located on the elegant McGill Avenue, which connects downtown to the Old Port and the Lachine Canal, the Saint-Paul is also at the angle of the street of the same name, the main artery of the Old Montreal. Thus, its location is central and close to the main attractions of the city. The Square-Victoria metro station (line 2 – Orange) is 300 meters away.